16th of May was a very sad and tragic day for us Metalheads. Not only legendary, very influential singer Ronnie James Dio passed away on that day, but also legendary Bay Area manager, Debbie Abono has lost her fight again cancer. Now you can read about her. Extra special thanks goes to ex-Combat A&R guy Don Girovasi considering his writing about Debbie Abono. 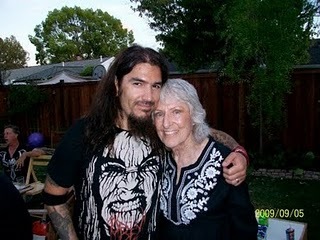 Debbie Abono (August 31, 1929 – May 16, 2010) was an American manager of death metal and thrash metal bands during the 1980s and 1990s. Abono was born in Oakland, California as Deborah Ann Downer, a granddaughter to E.M. Downer, who founded Bay Area financial institutionMechanics Bank. She had served on the Board of Directors for the bank at one time. Her career as a heavy metal manager began in her mid-fifties when the members of Possessed, one of the first death metal bands, asked her to manage the group. After they assured her there was "nothing to it ... all you gotta do is get us shows," she agreed and even let them practice at her house. A grandmother at that time, Abono had no connections to heavy metal music other than through one of her daughters, who was dating Possessed's then-guitarist Larry LaLonde. According to author David Konow, Abono was unaware of the sometimes blasphemous themes of heavy metal, and was offended after reading the lyrics to Seven Churches, the band's debut album. Nevertheless, she agreed to continue managing Possessed on the condition that LaLonde and vocalist Jeff Becerra finished high school. Because Possessed suffered from internal conflicts, Abono would go on to manage additional bands in the Bay Area metal scene likeExodus, Vio-Lence and Forbidden, as well as death metal bands like Chicago's Broken Hope and Florida's Cynic and Obituary. Other bands that she managed include Brazilian outfit Sepultura and American band Skinlab. Abono died on Sunday, May 16, 2010 at approximately 9:59 a.m. PST after a battle with cancer. She was 80 years old. Commented EXODUS guitarist Gary Holt: "I have to say what a heartbreaking moment it is for me to have learned that Debbie is no longer with us. She was extremely instrumental to EXODUS, both in our early years and again during our reunion with Paul [Baloff] in '97. We could not have done a lot of the things we did without her help and generosity. The tour with VENOM and SLAYER would not have been possible, as well as our first U.S. tour without her help. She is, and always will be, a true Bay Area metal legend, and no one has done more for that young upstart thrash scene than she. She will be greatly missed — by EXODUS, as well as so many, many other bands she had worked tirelessly for. Words don't really do justice to what she has meant to us. All the love and support to her family at their time of need from us and the entire Bay Area metal scene. We all love you, Debbie." Stated FORBIDDEN guitarist Craig Locicero: "[Sunday was] a very, very sad day for all of FORBIDDEN past and present. We lost our first manager, mentor and mother to us all in Debbie Abono. I have many stories to share once I gather myself off of the floor. Most of them are pretty funny, too. We had great times together and she showed FORBIDDEN the ropes. I was lucky enough to get a message to her in her last days. She knew how much she meant to FORBIDDEN and to me. I did get many chances to visit her over the last few years, too. I am very grateful for that. We are forever indebted to Debbie for all she did and most importantly the love and wisdom she instilled in us. FORBIDDEN is dedicating our new record to Debbie in her honor. So from all of us, this one is for you! "Rest in Peace, Debbie. You beautiful soul!" P.R. told BLABBERMOUTH.NET: "[Debbie] lived an incredible, brave, courageous, beautiful, giving life right to the end. She touched more people than we can count and more people that even know her. We also gave her an immeasurable amount of pleasure and happiness. "I know I'm not alone." According to David Konow, author of the "Bang Your Head: The Rise And Fall Of Heavy Metal", Debbie Abono was in her mid-fifties when she began to manage a band named POSSESSED. Abono started taking her daughters to MOTÖRHEAD shows, where the members of POSSESSED first asked her to manage the band. "There's nothing to it," they told her. "All you gotta do is get us shows." Abono agreed and even allowed them to practice at her house. POSSESSED's association with Debbie Abono would be a "first" for both sides: Abono would be the band's first manager, and POSSESSED were Abono's first managed band. 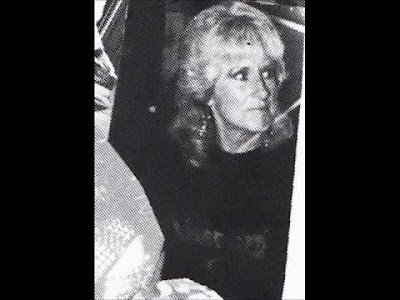 Abono had no previous connection to heavy metal music other than as a concert designated driver for her daughters, one of whom was a girlfriend of guitarist Larry LaLonde. Due to generation gap, Abono also had limited awareness of the sometimes blasphemous themes of heavy metal, and was allegedly offended upon reading the lyric sheet of "Seven Churches". Nevertheless, she agreed to manage and represent POSSESSED as long as bassist/vocalist Jeff Becerra and LaLonde finished high school commitments. Although the group's relationship amongst themselves and their first manager would reach points of discord and eventual termination, Abono would go on to manage additional bands in the Bay Area metal scene like EXODUS, VIO-LENCE and FORBIDDEN EVIL (pre-FORBIDDEN), as well as death metal bands like Chicago's BROKEN HOPE and Florida's CYNIC and OBITUARY. Don Girovasi's e-mail for me about Debbie Abono. I first met Debbie Abono a few weeks after I started working at Combat Records in late 1986. I honestly had never even heard of the woman until I was informed that she managed Possessed. Imagine my surprise when I found out that she managed or was at least somehow involved with many of the bands I loved: Vio-Lence, Forbidden...I can't even remember who else after all these years. She was sort of a "den mother" to all these bands, and I never saw or heard anyone treat her with less than the utmost respect. I had spoken with her briefly before our first meeting, and I was a little taken aback by her pleasant phone manner and demeanor. I was like "This woman manages POSESSED? She sounds too NICE!" I never did find out how she got started working with Bay Area thrash bands, but that woman had a lot on her plate; she managed bands, she raised a family, and I think she was a loan officer at a bank. I doubt that she had much "free time." And she was always willing to lend a friendly ear to anything you had on your mind, even if it had nothing to do with her or any of her bands. We'd be on the phone and she'd stop me and say "What's wrong? You don't sound like yourself today." I could tell her what was on my mind, and she'd offer advice. She'd make me promise to tell her how things worked out. I certainly never met anyone else like her in the music business. 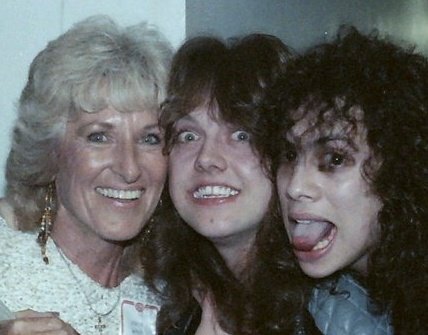 Then I found out that she was one of the very first people James Hetfield called the night Cliff Burton was killed, which ought to hammer home what an important figure she was in the annals of metal history. The last time I saw her was when she sat behind me in the press area at a Metallica show in New Jersey. It was on the "Justice" tour (which, consequently, was the last time I saw those guys live until the Death Magnetic tour last year). When Metallica played the slow part of "To Live Is to Die," they sat on the drum rise as a "tribute" to Cliff as they played. I'll never forget how choked up she got at that moment. Then she gave me a big hug and we went our separate ways.